What makes these cookies so special? 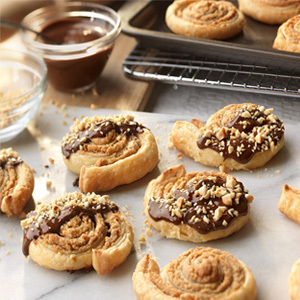 Using puff pastry ensures perfectly delicious cookies every time. 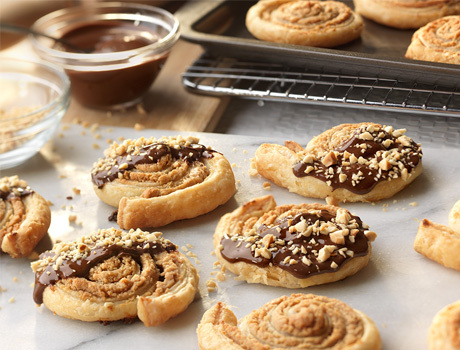 And, you can never go wrong with the combination of chocolate and peanut butter. These may be the best cookies youve ever made, so give them a try...your kids will thank you. Heat the oven to 400°F. Stir the cream cheese, peanut butter, sugar and vanilla extract in a medium bowl until the mixture is smooth. Sprinkle the flour on the work surface. Unfold the pastry sheet on the work surface and roll into a 12-inch square. Spread the cream cheese mixture on the pastry sheet to within 1/2-inch of the edge. Roll up the pastry like a jelly roll. Cut the pastry roll into about 20 (1/2-inch) slices. Place the slices, cut-side down, on 2 baking sheets. Microwave the chocolate chips and shortening in a microwavable bowl on HIGH for 30 seconds. Stir. Repeat until the mixture is melted and smooth. Spread the chocolate mixture on half of each cookie and sprinkle each with 1/2 teaspoon peanuts.